Posted on April 1, 2013 by Sarah S.
One night I was craving chicken tacos, and I ended up trying to make my own tortilla chips. I was surprised to find them simple to make and very delicious. 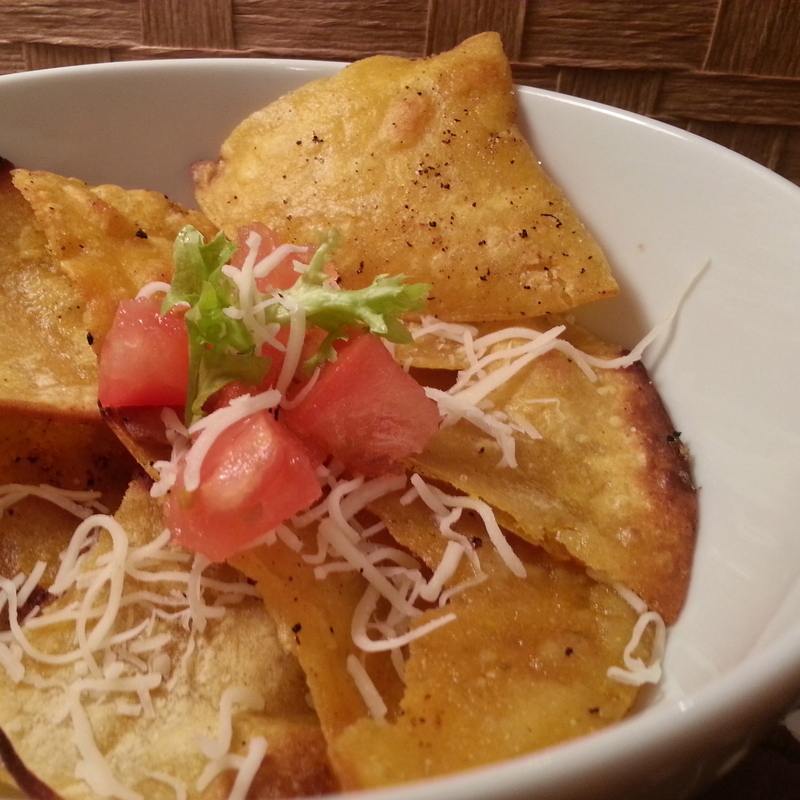 They were a great addition to my quick and easy chicken taco/nacho recipe. Heat 3 tablespoons of olive oil in a non-stick pan. Medium/High heat is preferred, but be careful when handling the hot oil! Cut corn tortillas in quarters (I used small tortillas, so a quarter was the size of a chip) and place into oil. Heat the tortillas, flipping occasionally, for a few minutes until the tortillas have become crisp. I added salt and paprika while they were heating for an extra kick. Cut the chicken breasts into bite-sized pieces. Heat a tablespoon of olive oil in a non-stick pan and add the chopped onion. After a few minutes, add the chicken pieces. Add spices to taste: paprika, salt, pepper, and green chilies. Cook until chicken is throughly cooked. Add chicken to chips and top with mozzarella cheese, tomatoes, and lettuce. Super easy, pretty quick, and very delicious! 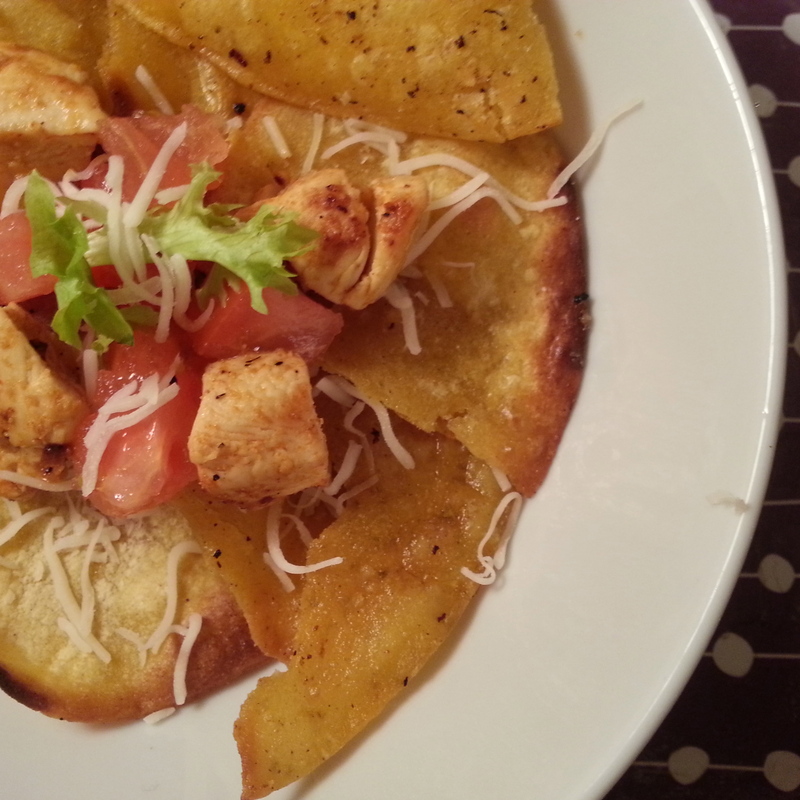 This entry was posted in Food and tagged chicken nacho recipe, chicken nachos, homemade tortilla chips, recipe. Bookmark the permalink.